Shell Access on OpenShift is possible through the command line tool. Basic UNIX commands and their own commands can be executed on OpenShift PaaS Cloud. MySQL supports interactive mode as well. Although it is not possible to run all the commands we usually run through SSH / Telnet, actually these are handy for the user. There are advanced users, who might want to enjoy the shell access on OpenShift – its enabled for the free quota too. Shell Access on OpenShift : What we Saw and Did ? Like Heroku PaaS, OpenShift also uses an app folder to run the apps (can be seen from their source code too). Actually this is not the real webroot what we normally use. Vim works, this is possibly a big plus point over Heroku. 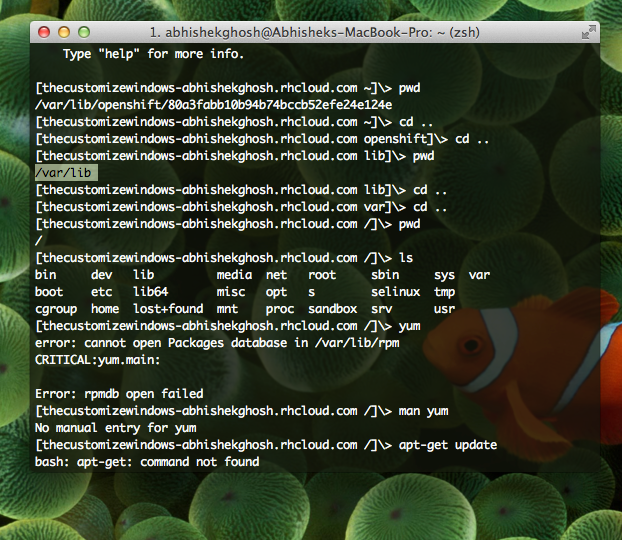 Normal commands which usually do not require root privilege, works. Some commands which requires root privilege also works – like make command. For installing custom softwares, possibly this is the practical way. We noticed that, actually as expected; all server softwares or web frameworks are actually accessible from this user level. They are restricted from the App level. So, which python or which ruby command will show you the path. Not all PHP components are installed, a bit in better condition than Heroku but practically this makes PaaS as a whole pretty useless for custom software usages. PaaS are good for running ready made web softwares like WordPress or simple PHP, Node.js apps, but they fails to deliver the things we want for free – like installing Gitlab is a definite pain on any of these PaaS. Despite so much business competition, not many actually gives a full server with SSH access. We wish some funky ‘as a service’ discovery will further increase the competition – we can enjoy more things (including poison) for free of cost. This Article Has Been Shared 1442 Times! Installing WordPress Rackspace Cloud Sites is very easy. However, Rackspace uses their own version of Control Panel. Here is full step by step guide. Cite this article as: Abhishek Ghosh, "Shell Access on OpenShift," in The Customize Windows, April 16, 2013, April 21, 2019, https://thecustomizewindows.com/2013/04/shell-access-on-openshift/.